The most important French porcelain factory was founded in 1740 in the royal château of Vincennes. In 1756 it was transferred to Sèvres, the other side of Paris, and shortly after was bought by Louis XV. The support and protection of the king and his mistress, Madame de Pompadour, enabled it to secure the best artists, sculptors, designers and chemists. Sèvres porcelain soon became the most sought after in Europe. The royal manufactory at Sèvres specialised in luxury porcelains, many of which were destined for the French court. Each year it displayed its newest models in the king's apartments at Versailles. The factory was very responsive to changes in fashion and introduced many innovations in design and decoration. Its products were admired throughout Europe and its style was widely imitated. Porcelain figures evolved as table decorations to replace those made of sugar or wax. Elaborate table ornaments were an important part of grand dining and figures were usually designed to be seen from all sides. 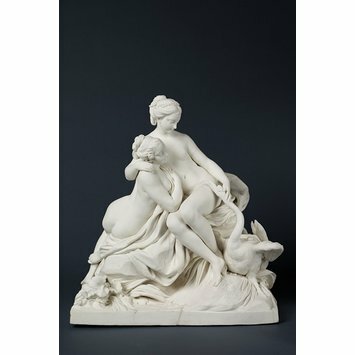 Pastoral groups, playful children, and allegorical or mythological themes were some of the popular subjects illustrated in porcelain sculpture. From the 1760s, large sculptures, busts of famous people and groups commemorating historic events were produced as freestanding works of art in their own right. Figures were usually made from moulds in numerous separate parts, which were painstakingly assembled before the first firing. The royal manufactory at Vincennes/Sèvres was responsible for some of the most outstanding examples. 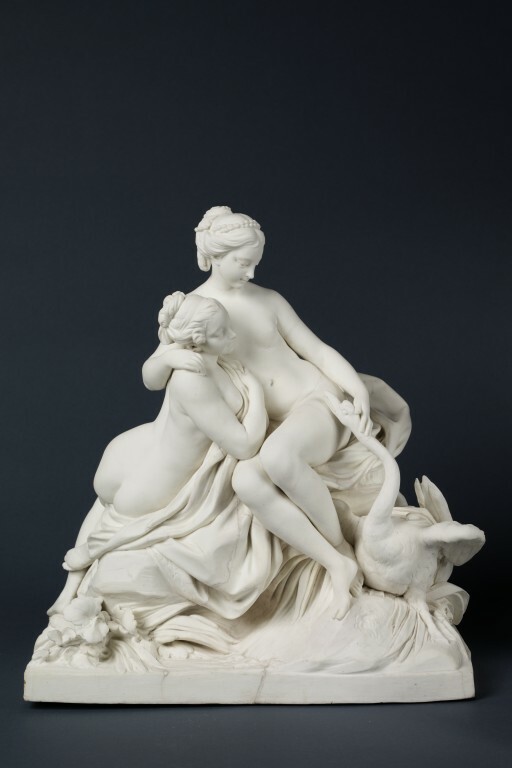 Under the direction of the celebrated sculptor Etienne-Maurice Falconet, the Sèvres workshops were inspired by a variety of sources, including designs by other fashionable artists, such as François Boucher, as well as ancient Roman marbles and reliefs. White, unglazed 'biscuit' porcelain was launched in 1751. It proved an ideal substitute for sugar sculpture and soon replaced the production of glazed figures at Sèvres. Biscuit sculpture was as highly prized as that of marble or bronze. Faults and blemishes could not be concealed by glaze or painted decoration, so it was extremely expensive to produce. Figure group depicting Leda and the Swan, biscuit porcelain. Bückling, Maraike eds. Gefährliche Liebschaften: Die Kunst des Französischen Rokoko. Hirmer: Munich, 2015. ISBN 9783941399549. It was modelled by Falconet after Boucher's painting of 1742. It was first made in 1764. See Falconet a Sevres, Musee de Sevres, 2001, cat. 99, where this one is dated 1764-6.